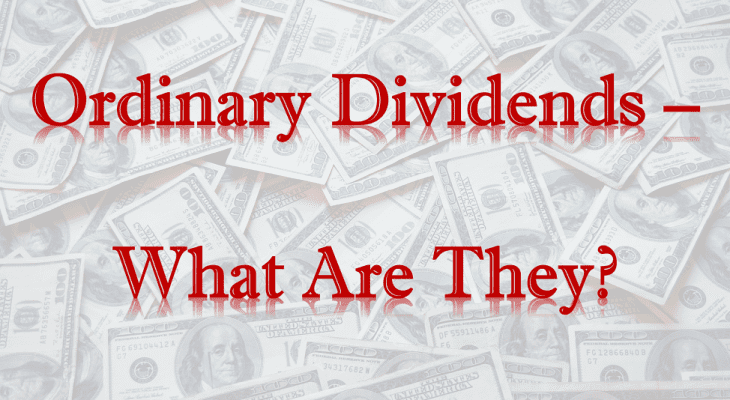 Ordinary Dividends – What Are They? While high-dividend equities are the primary target of income investors, the particular class of dividend distribution — ordinary dividends or qualified dividends — can enhance or reduce the total after-tax return on shareholders’ investment. In the most general terms, dividends are simply periodic payments that companies and other securities use to transfer a portion of their earnings or assets to their stakeholders. The different sources of dividend distributions affect dividend income taxation levels, as well as the terminology used to differentiate the payout types. Equities like C-Corporations generally use their earnings for payments to their shareholders. These shareholder payouts do not figure into the original cost basis of buying the stock and are generally called dividends. However, other types of securities — including limited liability corporations (LLCs), partnerships, S-Corporations, trusts, estates, etc. — generally transfer equity to their stockholders. These types of payouts figure into an investor’s cost basis for taxation purposes and are generally called distributions. In most instances, dividend distributions take form of cash payouts. Ease of management, distribution and accounting make cash dividends the preferred choice for dividend distributors and dividend recipients. However, equities also occasionally use other methods of dividend disseminations, called in-kind dividend distributions. Even the in-kind dividend distributions have subcategories. The most frequently used in-kind dividend payout type are stock dividends. In addition to stock dividends, other types of in-kind dividend distributions include property dividends, bonds of the company distributing dividends, bonds of a different corporation, government bonds, accounts receivables and promissory notes. To define ordinary dividends, we first must define the other class of dividends. Qualified dividends are a special classification of cash dividends that meets specific requirements set by the Internal Revenue Service (IRS) and are eligible for taxation at capital gains taxes. Therefore, ordinary dividends — sometimes also called “non-qualified dividends” — are all dividend distributions that are not classified as qualified dividends. Unlike qualified dividends, ordinary dividends do not benefit from any favorable tax treatment and are generally taxed as ordinary income. Tax rates on ordinary income are usually higher than capital gains tax rates applicable to qualified dividends. Therefore, qualified dividends can generate higher after-tax returns than ordinary dividends. Investors with high levels of dividend income that pay their taxes at the rates applicable to the top tax bracket can save as much as 46% on their federal income taxes with qualified dividends. As defined by the IRS, ordinary dividends are paid out from earnings and profits and are considered ordinary income. Furthermore, ordinary dividends have additional rules and restrictions. Investors will generally receive a Form 1099-DIV that will include the total amount of ordinary dividend distributions. Unless otherwise noted, dividends received on common and preferred stock are ordinary dividends and the amount will appear in box 1a of the 1099-DIV form. However, even if the dividend payouts meet the eligibility requirements for qualifying dividends listed in the next section, certain dividend distribution types will still be only ordinary dividends. For instance, dividend distributions from real estate investment trusts (REITs), master limited partnerships (MLPs) and tax-exempt companies are always treated as ordinary dividends. Additional examples of dividends that are not eligible for qualified dividends status are special dividends, one-time dividends and employee stock option dividends. Dividend distributions that are technically interest distributions, such as payouts from money market accounts, must be reported as interest income. Also, any dividend distributions associated with hedging — call options, put options, short sales, etc. — can not be classified as qualified dividends and are subject to taxation at the higher tax rates reserved for ordinary income. However, while the total amount of qualified dividend distributions generally appears in box 1b of the IRS 1099-DIV form, IRS created several exceptions. In addition to being shown in the 1b box of the 1099-DIV form, qualified dividend distributions must not be included on the IRS list of Dividends that are not qualified dividends. Any dividend that falls into any category listed below is automatically classified as an ordinary dividend and taxed as such. Dividends paid on deposits with mutual savings banks, cooperative banks, credit unions, U.S. building and loan associations, U.S. savings and loan associations, federal savings and loan associations, and similar financial institutions. Report these amounts as interest income. Dividends from a corporation that is a tax-exempt organization or farmer’s cooperative during the corporation’s tax year in which the dividends were paid or during the corporation’s previous tax year. Dividends paid by a corporation on employer securities held on the date of record by an employee stock ownership plan (ESOP) maintained by that corporation. Dividends on any share of stock to the extent you are obligated — whether under a short sale or otherwise — to make related payments for positions in substantially similar or related property. Payments in lieu of dividends, but only if you know or have reason to know the payments are not qualified dividends. Payments shown on Form 1099-DIV, box 1b, from a foreign corporation to the extent you know or have reason to know the payments are not qualified dividends. Ordinary tax rates have seven tax brackets and qualified dividends have only three. However, qualified dividend breaks between the tax brackets used to be aligned with some of the breaks for ordinary dividends. Investors who had qualified dividend income equivalent to ordinary income in the 10% or the 15% bracket paid no federal income taxes on that qualified dividend income. Additionally, the qualified dividend income equivalent to the 39.6% top bracket for ordinary income was subject to a 20% tax rate on qualified dividend income. Lastly, investors that were in the four middle brackets — 25%, 28%, 33% or 35% — paid a 15% tax rate for their income derived from qualified dividends. 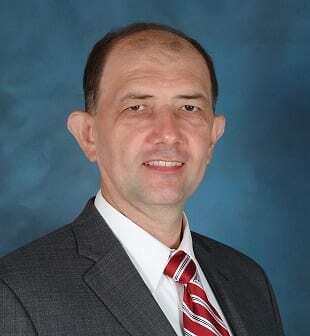 However, following taxation changes in Tax Cuts and Jobs Act (TCJA) passed by Congress on December 22, 2017, the tax brackets breaks for ordinary income changed and qualified dividend tax bracket breaks no longer align with ordinary income tax brackets. Starting with the 2018 tax year, qualified dividends are subject to the income brackets shown in the table below. Alternatively, ordinary income tax rates from the table below apply to all investors’ income derived from ordinary dividends. Qualified dividends are attractive to investors because of their tax advantages. However, ordinary dividends are available from a wider selection of securities, including certain classes of equities that are never eligible for qualified dividend status but offer very high dividend yields, such as REITs or MLP’s. While minimizing tax liability is an important consideration, investors will generally disregard tax implications and initially evaluate securities based on other characteristics. Dividend yields, history of dividend payments, number of consecutive dividend hikes, the company’s financial results, the stock’s share price history and other metrics are more important than tax rates for the selection of equities with high dividend distributions and outstanding total returns. However, when facing a choice between two or more equities with similar characteristics, investors should evaluate tax implications and select the investment that offers tax advantages. Both types of dividend distributions offer distinct benefits. Therefore, investors should take advantage of all available opportunities and construct a diversified investment portfolio that contains both types of dividend distributions.